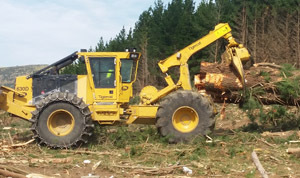 Besides having a firewood crew that processes and delivers firewood throughout Christchurch and its nearby rural areas, Davies Tree Service also has a separate logging crew. Our logging crew is a highly experienced, ground based crew that works all year round to harvest forests and large woodlots throughout Canterbury. We specialise in mechanical harvesting of trees on both flat land and steep hill country blocks. Our operation uses modern well maintained machines. These include a 30 tonne Sumitomo excavator with a Pro 700 Woodsman Processor, a Hitachi ZX290 excavator with a Pro 1320 Woodsman Felling Head, a John Deere forwarder, a Tigercat 630D skidder and a Tigercat 1075C Forwarder . 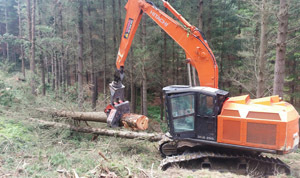 These machines and our experienced operators enable our company to efficiently fell, process and load logs in order to maximise the value of the logs to the forest owner. We have markets for all grades of logs produced from our harvesting operation; from pruned domestic sawlog to export grade to logs suitable for chip and firewood. 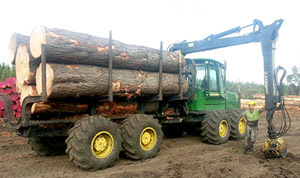 We pride ourselves in having a safe, tidy and professional working environment and in being able to manage the complete logging process involved when assessing, harvesting, transporting and marketing logs. © 2019 Davies Firewood. 117 Miners Road Templeton, Christchurch, New Zealand.